The County High School, Leftwich is delighted to support the wider community. We host, among others, Bostock Band and Leftwich Rainbows and Brownies. Many groups hire the Gym, the Multi Use Games Area (MUGA) and other facilities. For more information on hiring our facilities please click here. We are proud to be an Extended Services School and as such we are eager to signpost valuable learning opportunities, services and contacts. If you have suggestions for further links, please contact the school via email. Our students are given opportunities to develop their skills in enterprise. All our Year 10 students take part in the Lionheart Challenge with the winning team going on to the regional final in Liverpool. An important link between enterprise and service is established through the annual Senior Citizens' Christmas Party. 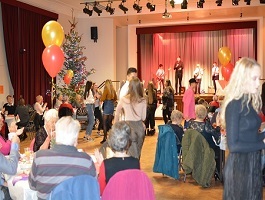 In mounting this event for the local community, Year 11 students raise the finance as well as presenting the entertainment and acting as hosts.